It didn’t take long for Avingard to reach Silent Moons Camp. The camp didn’t look much like any camp Avingard has seen in the past, but instead, Silent Moons Camp looked more like old ruins. The camp had been cut into a rock cliff, with a large staircase climbing high to the top of the camp where it ended at a rock building. On the west side were a few tents and a cooking area. On the right was a large door protruding from a rock. Looking around the camp Avingard spotted two bandits milling about keeping watch over the entrance. Using the large rocks that were near him, Avingard slowly made his way towards the camp, hoping to take the bandits by surprise. Suddenly, Avingard heard an archer call out so Avingard removed his greatsword and charged forward. As he did so, a large lightning bolt struck Avingard in the side. A bandit mage, spotting Avingard running towards the other bandit, unleashed a bolt of lightning at Avingard. He fell on his back, but as quickly as he could, Avingard scrambled to his feet and took cover behind a large rock. He peaked out from behind the rock and noticed a bandit archer was engage in battle against two wolves. The bandit had called out to engage in combat against the wolves, and didn’t see Avingard after all. Avingard had given himself away, and was now targeted by a bandit mage. The bandit mage slowly crept up to Avingard, and fired another bolt of lightning, which Avingard dodged. He quickly moved close enough to the mage, who was surprised with how close Avingard had come to her, but before she could react Avingard slashed with his greatsword and cut down the mage. Meanwhile, one of the wolves had spotted Avingard and began charging. Hearing the growling and scampering, Avingard turned to meet the challenge. The wolf lunged, which Avingard dodged, and then swung his sword at his adversary, striking the wolf in the back and killing it. Before Avingard could catch his breath, an arrow stuck the ground nearby, causing Avingard to immediately turn around. The bandit archer had killed the second wolf and was now targeting Avingard. Avingard began charging the bandit archer, weaving and dodging any arrows until he closed the gap between him and the archer. The archer pulled out his dagger to challenge Avingard to melee combat. Avingard swung his sword at the archer, who dodged the large weapon, and then struck the side of Avingard with his dagger. The dagger didn’t do much damage as the archer had struck Avingard while off balance, and the steel armor being too strong for a light blow. While the archer attempted to regain his balance, Avingard thrust his sword into the belly of the bandit, who slumped over the sword before falling to the ground. Looking around, Avingard could see no other bandits, so he looted what he could from the two dead bandits before proceeding up the stairs. Avingard proceeded slowly up the stairs until he reached the top. He could hear two voices coming from inside the stone building at the top. There were two entrances to the building, so he was unsure which one would be best to enter to keep himself concealed. As he looked at the entrances, Avingard noticed human shadows forming from the west entrance, but instead of entering through the east entrance, Avingard stood behind a wall at the west entrance. As the two bandits emerged from the building they looked down below at their dead comrades. As one bandit readied his bow, Avingard struck. First slashing the archer and then thrusting his sword in the second bandit, sending them both down to the rocky ground. Avingard entered the building and walked around. As he walked a doorway to his right appeared, which Avingard peered through. It was a forge and there were no bandits inside. Avingard searched the forge and found a few weapons and ingots, but nothing of any real value. He did take a few things that might bring a few gold and then left through the same doorway. He continued to walk around until he reached the second entrance and then left the building. Avingard didn’t find the bandit leader, at least none that he thought was the leader. He then remembered the door at the base of the staircase. Rushing down the stairs, Avingard reached the door and slowly opened it. The door lead into a room that was fairly dark as it was only lit with a few torches. There was only one way to go, so Avingard slowly walked down a short hallway, which became almost pitch black at times. He eventually reached a second hallway that went off to his right. As Avingard approached the second hallway a few rocks moved creating a noise that resonated through the two hallways. “Who’s there?” a man with a deep voiced questioned. Avingard could hear the sound of a weapon being drawn and heavy footsteps coming closer. Suddenly a large Nord appeared from the hallway carrying a large axe. Without wasting any time, Avingard swung his sword at the Nord, who immediately blocked the attack. In retaliation, the Nord swung his large axe at Avingard, missing him by only inches, causing the axe to clang against a stone wall. Avingard used his greatsword to knock the axe to the ground, and the swung it striking the Nord in the right arm. Avingard battles the bandit leader. The Nord screamed in pain and attempted to lift his axe with his left hand, which he managed to do. He once again swung the axe, as best he could, at Avingard, but only hitting air. 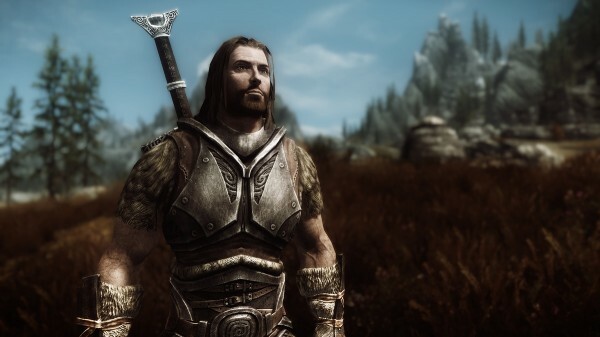 Avingard thrust his sword into the armor of the Nord as hard as he could, causing the Nord to take one last breath, before dropping his axe and falling to the floor. Avingard tumbled back in exhaustion, but quickly recovered and rose to his feet. He looked down at the large Nord and searched him. He didn’t find too much of value, so continued down the hallway. Avingard discovered two more archers as he explored the remaining areas of Silent Moon Camp, which he disposed of quickly because of the close confines of the hallways and rooms. At such close range, Avingard’s greatsword was deadly, and could easily reach any bandits in close quarters. Avingard eventually came to a ladder that led up, which Avingard climbed. He opened the hatch at the top of the ladder and entered a small room which was outside. He found a chest, which he opened, and managed to find some iron gauntlets, which he put on. Looking around the small room, Avingard found a latch that opened a door, allowing Avingard to exit the room into the area he had arrived at first. Below he could see the two dead bandits and wolves, and determining that no other bandits were still alive at Silent Moons Camp, Avingard descended the staircase. Avingard outside Silent Moons Camp. As he surveyed the damage he had done to the bandits, Avingard stopped by the kitchen area and grabbed some of the food that was cooking over an open fire. He ate some of the venison, which was the most he has had in several days. After enjoying the meal, Avingard started to make his way back to Whiterun to collect his reward. The way back wasn’t exciting as he only had combat with two mudcrabs near a small pond. He was tired, though, from the fighting at Silent Moons Camp, but it was only midday, and he wanted to complete the second task before nightfall and then head for Solitude tomorrow. He arrived at Whiterun and opened the large doors to enter the city.